The Masai giraffe (Giraffa camelopardalis tippelskirchii), also spelled Maasai giraffe, also called Kilimanjaro giraffe, is the largest subspecies of giraffe. It is native to East Africa. The Masai giraffe can be found in central and southern Kenya and in Tanzania. It has distinctive, irregular, jagged, star-like blotches which extend to the hooves. A median lump is usually present in males. The IUCN currently recognizes only one species of giraffe with nine subspecies. The Masai giraffe was described and given the binomial name Giraffa tippelskirchi by German zoologist Paul Matschie in 1898. 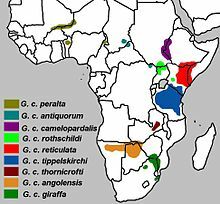 The Masai giraffe was named in honor of Herr von Tippelskirch who was a member of a German scientific expedition in German East Africa to what is now northern Tanzania in 1896. Tippelskirch brought back the skin of a female Masai giraffe from near Lake Eyasi which was later on identified as Giraffa tippelskirchi. The Masai giraffe is distinguished by jagged spots on its body, geographic range including southern Kenya, all of Tanzania, and the Luangwa Valley in Zambia, and genetic evidence. It is the largest-bodied giraffe species, making it the tallest land animal on earth. All giraffes are considered vulnerable to extinction by the IUCN, and the Masai giraffe population declined 52% in recent decades due to poaching and habitat loss. Overall, the approximate number of all populations accumulate to 32,550 in the wild. Demographic studies of wild giraffes living inside and outside protected areas suggest low adult survival outside protected areas due to poaching, and low calf survival inside protected areas due to predation are the primary influences on population growth rates. Survival of giraffe calves is influenced by the season of birth, and the seasonal local presence or absence of long-distance migratory herds of wildebeest and zebra. Metapopulation analysis indicated protected areas were important for keeping giraffes in the larger landscape. In situ conservation of Masai giraffes is being done by several government agencies including Kenya Wildlife Service, Tanzania National Parks, Zambia Wildlife Authority; and non-governmental organizations including PAMS Foundation, and Wild Nature Institute. Community-based wildlife conservation areas have also been shown to be effective at protecting giraffes. At several zoos, Masai giraffe have become pregnant and successfully given birth. ^ a b IUCN (2016). "Giraffa camelopardalis: Muller, Z., Bercovitch, F., Brand, R., Brown, D., Brown, M., Bolger, D., Carter, K., Deacon, F., Doherty, J.B., Fennessy, J., Fennessy, S., Hussein, A.A., Lee, D., Marais, A., Strauss, M., Tutchings, A. & Wube, T.". IUCN Red List of Threatened Species. doi:10.2305/iucn.uk.2016-3.rlts.t9194a51140239.en. ^ Fennessy J.; Bidon T.; Reuss F.; Kumar V.; Elkan P.; Nilsson M.A. ; Vamberger M.; Fritz U.; Janke A. (2016). "Multi-locus Analyses Reveal Four Giraffe Species Instead of One". Current Biology. 26 (18): 2543–2549. doi:10.1016/j.cub.2016.07.036. PMID 27618261. ^ Brown, David M.; Brenneman, Rick A.; Koepfli, Klaus-Peter; Pollinger, John P.; Milá, Borja; Georgiadis, Nicholas J.; Louis, Edward E.; Grether, Gregory F.; Jacobs, David K. (2007-01-01). "Extensive population genetic structure in the giraffe". BMC Biology. 5: 57. doi:10.1186/1741-7007-5-57. ISSN 1741-7007. PMC 2254591. PMID 18154651. ^ Dagg, A.I. ; Foster, J. B. (1982). The Giraffe. Its Biology, Behavior, and Ecology (with updated supplementary material). Malabar, Florida: Krieger Publishing Company. ^ "Giraffa camelopardalis (Giraffe)". www.iucnredlist.org. Retrieved 2016-12-08. ^ Lee, Derek E.; Bond, Monica L.; Kissui, Bernard M.; Kiwango, Yustina A.; Bolger, Douglas T. (2016-05-11). "Spatial variation in giraffe demography: a test of 2 paradigms". Journal of Mammalogy. 97 (4): 1015–1025. doi:10.1093/jmammal/gyw086. ISSN 0022-2372. ^ Lee, D. E.; Strauss, M. K. L (2016-01-01). Reference Module in Earth Systems and Environmental Sciences. Elsevier. ISBN 9780124095489. ^ Lee, Derek Edward; Bond, Monica Louise; Bolger, Douglas Thomas (2017-01-01). "Season of birth affects juvenile survival of giraffe". Population Ecology. 59 (1): 45–54. doi:10.1007/s10144-017-0571-8. ISSN 1438-3896. ^ Lee, Derek E.; Bolger, Douglas T. (2017-05-05). "Movements and source–sink dynamics of a Masai giraffe metapopulation". Population Ecology. 59 (2): 157–168. doi:10.1007/s10144-017-0580-7. ISSN 1438-3896. ^ Lee, Derek E; Bond, Monica L (2018-02-26). "Quantifying the ecological success of a community-based wildlife conservation area in Tanzania". Journal of Mammalogy. 99 (2): 459–464. doi:10.1093/jmammal/gyy014. ISSN 0022-2372. PMC 5965405. PMID 29867255. ^ Lee, Derek E. (2018-08-10). "Evaluating conservation effectiveness in a Tanzanian community wildlife management area". The Journal of Wildlife Management. 82 (8): 1767–1774. doi:10.1002/jwmg.21549. ISSN 0022-541X.